Were you able to guess when this week’s Flashback Friday photo was taken? This photo was taken in 1942 on South Grand Avenue looking north. The building on the left is, of course, Saint Louis University Hospital, a.k.a. Firmin Desloge Hospital, dedicated in 1933. The smokestack in the background is the Pevely Dairy smokestack. According to Andrew Young’s “St. 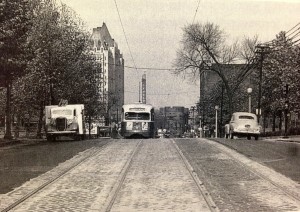 Louis and its Streetcars,” the photo shows PCC streetcar 1620 heading south on Grand Avenue near the St. Louis University Hospital in the spring of 1942.